There are currently 1.8 billion young people between the ages of 10 and 24 in the world. This is the largest youth population ever. But 1 in 10 of the world’s children live in conflict zones and 24 million of them are out of school. Political instability, labor market challenges and limited space for political and civic participation have led to increasing isolation of youth in societies. 12 August was first designated International Youth Day by the UN General Assembly in 1999, and serves as an annual celebration of the role of young women and men as essential partners in change, and an opportunity to raise awareness of challenges and problems facing the world’s youth. From the very beginning, CNEWA has been at the forefront of efforts to help uplift, inspire and educate the world’s youth — and that mission continues every day around the parts of the world we serve. We are working to give disabled children a brighter future in Armenia; we are helping displaced families from Syria start over in Lebanon; we’re helping young Ethiopians learn new skills. And, as the image above shows, we’re also supporting sisters seeking to pass on the faith in corners of our world, such as Egypt, facing violence and persecution. All these efforts and more are bringing hope and help to the next generation. You can be a part of that mission, too! Check out this page to learn how. In hundreds of schools supported by CNEWA, the church — through priests, sisters, brothers and lay staff — offers a refuge from the realities of hatred, bigotry and disrespect. For a few hours each day, youngsters learn that God loves all of us and wants us to be at peace with each other. And oftentimes the lessons learned at these schools are long lasting, even life changing. This is part of the future for many areas of CNEWA’s world. These are the fruits of this form of evangelization. Read more. Want to know how you can support this wonderful work? Check out this link. In the sweltering, crowded Bourj Hammoud district of Beirut, a group of children from poor Christian families have discovered a summertime oasis of joy. The 390 children, ages 3 to 13, are participants in the Howard Karagheusian Commemorative Corporation’s day camp, funded in part by CNEWA . Held in a school, the seven-week day camp combines sports, games, art and activities such as cooking, music and dance with a mix of instruction in nutrition, hygiene, math, English and Bible study. The children also go on weekly outings to places their families normally are not able to afford. The camp gives children an opportunity “to have new friends, to enjoy their childhood, to have these moments of fun and lovely memories within their miseries,” Serop Ohanian, the corporation’s Lebanon field director, told Catholic News Service. There are no playgrounds or green spaces in densely populated Bourj Hammoud, often referred to as Little Armenia. Settled by Armenians who had fled the early 20th-century genocide, the area has grown into a vibrant community. However, Lebanon’s economic crisis has caused more families to slip into poverty. The district also has seen Syrian refugees resettling there. Half of the camp participants are Lebanese Armenians and half are Syrian Armenian refugees from Aleppo, Syria. All are Christian. Armenian is the principal language spoken. The children are nurtured and guided by 34 volunteers, most of whom are university students majoring in education, psychology and special education, specially trained by the corporation. Volunteer Nver Bodozian, who works with 3-year-old children, is a refugee from Aleppo herself. She and her family came to Lebanon six years ago, early in Syria’s civil war. Her great-grandparents -- who fled the Armenian genocide -- originally settled in Aleppo. Bodozian and her family are hoping to obtain visas to be resettled in a Western country. Meanwhile, she is studying to become a teacher at Kinder Mesrobian College in Beirut. Bodozian and another volunteer have just completed an art activity with the preschoolers. Brilliant finger-painted butterflies, still drying, are hung across the classroom. Next on their program is short play, retelling “The Three Little Pigs” story. Young Migel, in the role of the wolf, “taps” on an imaginary door, making threatening “woo” sounds. His classmates, portraying little pigs, gleefully scoot around the room in feigned fright. “If they can have faith in God beginning at a young age, it’s everything,” Bodozian said. “Although not a faith-based organization, we do encourage the children and their families to trust in God and live by faith,” Ohanian explained. “We want to spread a beacon of hope within the community, within these neighborhoods and tell the children to dream big dreams, to get out from their difficulties and give them the opportunity to be a productive member within this community,” he said. Downstairs, recess is already underway for the 7- and 8-year-olds. Balls zigzag across the outdoor courtyard, following the rhythm of the children’s joy. Some kids stroll together, chatting with arms joined. A group of girls practice dance moves. Taking a break from shuffling a soccer ball, Kevin, 8, a refugee from Aleppo, said, “my best friends are here,” pointing to Sevag and Garbis, both of Lebanon. Their teacher, Alice Majarian, 26, told CNS that she calls the trio the Three Musketeers. Majarian recounted the camp’s first day when Kevin told his campmates that they should play nicely together. Kevin is “really organized and friendly,” Majarian said. Garbis, still eating his sandwich, hugs Majarian. “When you see the children growing and blossoming before you, it’s a great satisfaction,” she said as the trio resumes playing. The children come from “complicated” backgrounds, whether because of financial struggles in their family or from the hollowed-out existence as refugees, Majarian said. “These children are not refugees voluntarily. It’s really difficult to be pulled away from your house, surroundings and friends, to see how your parents and neighbors suffered. Digesting all those traumas is too much for children to handle,” she said. The corporation is a program of the Karagheusian Foundation, which was established in New York City in 1918 after the death of 14-year-old Howard Karagheusian from pneumonia. His parents resolved to establish a humanitarian mission in his memory, focusing at first on sheltering, feeding and educating orphaned children who had survived the Armenian genocide. The corporation has operated in Lebanon, Syria and Armenia for more than 95 years. The program’s clinic in Bourj Hammoud sees 2,500 patients a month; 70 percent are Syrian refugees and 30 percent are Lebanese. Of the refugees, 60 percent are Muslim and 40 percent are Christian. Children enrolled in the camp also receive a free medical checkup and dental care. 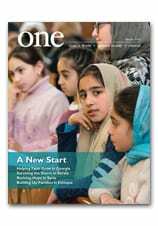 For another example of the generous work of the Karagheusian Corporation, read A Letter from Lebanon in the current edition of ONE.